With the DYMO S250 Portable Digital USB Shipping Scale you'll save time, money - and just maybe your back! Weigh packages up to 250 lbs (113 kg). 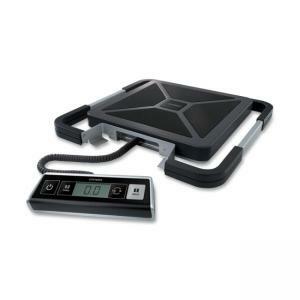 Grab the built-in handle and carry the scale to heavy items - instead of lugging heavy items to the scale! Or connect the scale via USB to a PC (1) or Mac(2) to use popular online mailing and shipping services (3) - including Endicia InstaRate (4) and DYMO Stamps (5) software. The DYMO S250 includes a detachable LCD display for convenient hand-held or wall-mounted viewing, time-saving hold and tare features, and much more. Powered by USB cable (included), AC adapter (included) or 3 AAA batteries (not included). 1. Works with Windows XP, Windows Vista or Windows 7 2. Works with Mac OS v10.4 or later 3. Weight restrictions may apply 4. Download at no charge 5. Download at no charge with creation of DYMO Stamps account.